almotamar.net, AP - SAO PAULO, Brazil - A missing Air France jet carrying 228 people from Rio de Janeiro to Paris ran into lightning and strong thunderstorms over the Atlantic Ocean, officials said Monday. Brazil began a search mission off its northeastern coast. Chief Air France spokesman Francois Brousse said it is possible the plane was hit by lightning. Air France Flight 447, an Airbus A330, left Rio on Sunday at 7 p.m. local time, 6 p.m. EDT, with 216 passengers and 12 crew members on board, company spokeswoman Brigitte Barrand. About four hours later, the plane sent an automatic signal indicating electrical problems while going through strong turbulence, Air France said. The plane "crossed through a thunderous zone with strong turbulence." An automatic message was received fourteen minutes later "signaling electrical circuit malfunction." Brazil's air force did not know where the aircraft disappeared, but a spokesman said it was searching near the archipelago of Fernando de Noronha because if an accident had happened in Brazilian waters, it would be in that area. Brazil's Air Force said the last contact it had with the Air France jet was at 9:30 p.m. EDT Sunday, but did not say where the plane was at that time. The spokesman said there was no immediate indication of what might have happened to the plane. He spoke on condition of anonymity in keeping with department policy. Two Brazilian Air Force planes were searching the waters about 300 kilometers northeast of the coastal city of Natal near the archipelago of Fernando de Noronha, a Brazilian air force spokesman said, speaking on condition of anonymity in keeping with air force policy. The region is about 1,500 miles northeast of Rio. A police official on Fernando de Noronha said the weather was clear on Sunday night. "It's going to take a long time to carry out this search," Douglas Ferreira Machado, head of investigation and accident prevention for Brazil's Civil Aeronautics Agency, told Globo news. "It could be a long, sad story. The black box will be at the bottom of the sea." Air France-KLM CEO Pierre-Henri Gourgeon, at a news conference in Paris, said the pilot had 11,000 hours of flying experience, including 1,700 hours flying this aircraft. No name was released. Aviation experts said the risk the plane was brought down by lightning was slim. "Lightning issues have been considered since the beginning of aviation. They were far more prevalent when aircraft operated at low altitudes. They are less common now since it's easier to avoid thunderstorms," said Bill Voss, president and CEO of the Flight Safety Foundation in Alexandria, Va. He said planes have specific measures built in to help dissipate electricity along the aircraft's skin. "I cannot recall in recent history any examples of aircraft being brought down by lightning," he told The Associated Press. Other experts said it was clear the plane was not in the air any longer, due to the amount of fuel it would have been carrying. "The conclusion to be drawn is that something catastrophic happened on board that has caused this airplane to ditch in a controlled or an uncontrolled fashion," Jane's Aviation analyst Chris Yates told The Associated Press. "I would suggest that potentially it went down very quickly and so quickly that the pilot on board didn't have a chance to make that emergency call," Yates said, adding that the possibilities ranged from mechanical failure to terrorism. 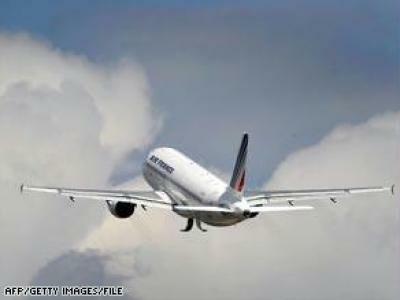 Barrand said the airline set up an information center at Charles de Gaulle airport for the families of those on board. That center said 60 French citizens were on the plane. Italy said at least three passengers were Italian. Air France said the 216 passengers included one infant, seven children, 82 women and 126 men. "Air France shares the emotion and worry of the families concerned," she said. The flight was supposed to arrive in Paris on Monday at 5:15 a.m. EDT, according to the airport. Airbus said it was cooperating with transport authorities and Air France, but would not further comment until more details emerged. "Our thoughts are with the passengers and with the families of the passengers," said Airbus spokeswoman Maggie Bergsma. The Airbus A330-200 is a twin-engine, long-haul, medium-capacity passenger jet, and is 190 feet long. It is a shortened version of the standard A330, and can hold up to 253 passengers. It first went into service in 1998, there are 341 in use worldwide today. It can fly up to 7,760 miles. French President Nicolas Sarkozy expressed his "extreme worry" and sent ministers to Paris' Charles de Gaulle airport to monitor the situation.